Do you work for Google Classroom? Learning about Google Classroom? We can help. Google classroom is one of the best tool for taking text and share document to multiple student using internet.It provide classroom calendar facility in which we can set event which is only for classroom member as reminder. User can see their work in this classroom or Make class room folder in which they can upload some document for specific subject. Teacher can upload their photo and generate code for joining classroom, they can also scheduled the test so when time comes it provide notification to all member of classroom. This is best tool for keep study document but for sharing this document with other it required admin's permission and after approving it, User can share this thing with other. There is no other feature to dislike about it. It very useful for collage and school who want to make their study more reliable, Teacher can make classroom for their respective subject and take test very easily. In this they can share document and important link for subject. It is easy way to reach out to all student. I use this tool since last 4 year, in my collage we create classroom for different subject and share different study material and important link in that. We also give multiple exam in this classroom for particular exam. It is easy way to reach classmate for help and share document with them.
" perfect space to design classes"
There are many benefits offered by this free tool. Making use of it not only means becoming familiar with the digital world, but optimizing processes, working together and improving every day so that all children can learn. Through the app you can create a class and once the class is created you add your students by sending them a code or adding them directly then you send them the tasks, they can be done at any time and from any device is not excellent and everything in real time, You can also see the progress of your students in each of the tasks adding that students can have all the content and material of the class in the same place. "Mejora tu experiencia en clase con Google Classroom"
Google Classroom encanta a profesores y alumnos por su elegante interfaz, que facilita las cosas mucho a la hora de organizar una clase. Es posible crear varios alumnos con los cual centralizar un repositorio común de recursos que les puedan ayudar en su evolución y aprendizaje. Además gratis lo ofrece gratis para las escuelas dentro del paquete G Suite for Education. Es una buena manera de evaluar a los estudiantes, asignarles tareas y ejercicios, subir presentaciones para seguir en clase, y habilitar una especie de zona foro para realizar preguntas y responder dudas, tanto entre ellos mismos como conmigo. Es posible utilizarla desde diferentes dispositivos, como smartphones, tabletas u ordenadores de escritorio, ya que al funcionar sobre el navegador, es independiente totalmente de la máquina. La única forma de acceder a la aplicación es con un correo electrónico, y eso con alumnos menores de edad puede ser un problema si no lo tienen hecho ya con el permiso de sus padres. Pero no es un problema en sí de la aplicación, que para mi funciona perfecta. Eso sí, requiere de conexión a Internet en todo momento, o no funcionará. Sería interesante una opción para poder agregar padres para que estuvieran al tanto de la actitud y evolución de sus hijos en el aula. Muy recomendable, gratuito, intuitivo y ayuda a profesores y alumnos en su aprendizaje. Me ha ayudado a mejorar la organización en clase y a facilitar el estudio a los alumnos, centralizando todos los recursos necesarios para cada asignatura. "Google classroom is a great way for me to keep in contact with my students"
I love google classroom because it allows me to keep in contact with my students. It is easy to use. I am able to update a calendar to communicate important dates with my student. I can also upload everything on there so that they know what's coming up and if they are absent they can check what they've missed. I can't think of anything that I dislike about it it is very easy to use. As a daily user, I don't have anything that I dislike about it because it was so easy to learn how to use and easy to explain to others. That is very important because I can show and explain to parents how they can use it to help their child. I noticed that it makes it even easier to communicate with my students and help them get the work they need. I also am able to easily communicate with parents on what they should currently be working on so there really isn't any reason why they would be doing poorly in my class. "Google Classroom is my class "homebase."" I love Google Classroom as a central hub for the many resources I employ in my middle school classroom (VoiceThread, YouTube, Google Apps, TypingClub, NaNoWriMo). If it weren't for this web service, my students would struggle much more with the many locations across the web they juggle each day. If the gradebook were more intuitive and featured a central place where I can store grades, add assignments not given on Classroom, and maybe even keep attendance, I would use it far more for my teacher tasks. If you are an educational institution, there is nothing keeping you from trying this service because IT IS FREE TO SCHOOLS, along with the many Google Apps for Education. If you are fearful of trying a new thing, be comforted that this is among the easiest tools to teachers out there. It's extremely simple and can prove helpful as you think of new ways to employ it in your everyday operations. Students need to engage online resources with their 1:1 Chromebooks, but they quickly grow frustrated if they don't know how to employ them or where to go next. Classroom keeps it simple by organizing it in one play in a user-friendly stream fashion. Students are online using their devices far more with this service. Google Classroom is not just for teachers. I have my teachers submit their weekly lesson plans and team meeting agendas on my Google Classroom. I love being able to schedule the “assignments”. It also lets me know who has turned their plans and agendas in, and on time. My teachers like that I can return their plans to them. This way they know I’ve seen them. I also upload documents for teachers to access (forms, letterhead,etc.) and even have our Google technology form on my Google Classroom for easy access for my teachers. Google Classroom is a great tool for organization! When I upload a resource it’s harder to find now than in the past. I have to give frequent reminders of how to find the resources (click the down arrow on the banner pic of your classroom). Google Classroom is a great organizational tool for teachers and administrators alike. Assignments all in one convenient place at your fingertips. It also provides you the ability to correspond back and forth with your users on assignments. The biggest problem Google Classroom has solved for me is organization. Before using Google Classroom teachers emailed their leason plans to me. I then had to upload them into a folder in Google Drive. If I needed a lesson plan I then had to go to Drive, find the folder then find the lesson plan. Through Google Classroom lesson plans are now organized in one spot by date and makes finding a particular lesson plan much easier, saving me many minutes in my work week. 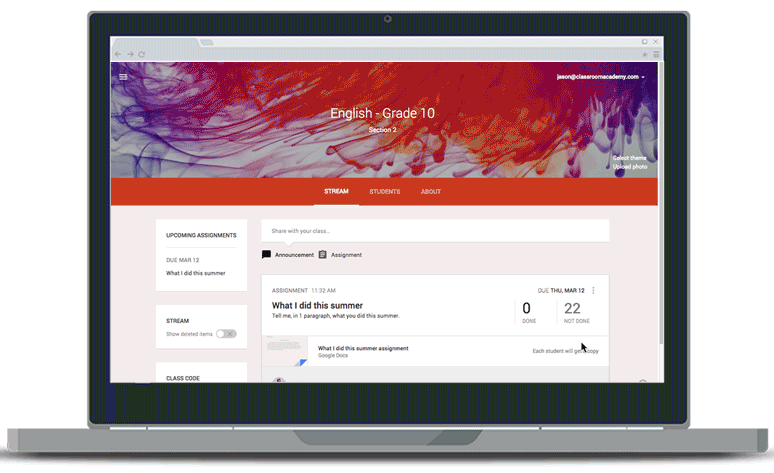 Google Classroom is a well designed LMS. It's amazing how well it integrates other Google Apps and products for a truly seamless implementation in the classroom. Having used Google Classroom for nearly 4 years, it has also changed and updated to meet the needs of teachers. Differentiation is now much more accessible through Google Classroom. It's easy for teachers and students to understand, and guardians can receive updates about their student as well. Any complaints I've had about Google Classroom have been changed over the years, and they actually let me know that my feedback helped make those design changes. I do get several complaints about the lack of gradebook integration (not super easy to get grades from Classroom to whatever system you're using) but I know Google Classroom is working on that. If you already use G-Suite, Classroom is a no brainer. Users will catch on instantly. Google Classroom is yes, used classically as a teacher-student interaction tool in our company. However, we also use it at the peer level to start discussions, share articles, distribute information, which can all be organized for easy access later on. "This Google application is very convenient and useful." thanks to this application of google is much what I have achieved with my students, what I like most is the ease of use, I can create my classes online and sign up all my students in it, we share information through the chat, it is a good way to use technology in education. I have used it and I do not see anything that I dislike, it only has as a limitation, that you must have access to the internet to use it, in addition to a google account, to be able to join the class. It is very useful, it really is a great strategy for teachers, you will not regret using it, it has gone very well for me. I am happy with everything I have achieved with this application and my students, their interest in the students has improved greatly, their school performance has been better than in previous years, it is always good to use another tool, and currently the technology is what attracts the most young people, it's good that google think about the teachers and help us with this application. "Google always surprises its users with good tools like this classrrom is excellent." is a good way to evaluate my students, what I like most is that I can assign all kinds of activities, I can prepare my class and share it with my students and only in the classroom we discuss their doubts and arguments, has made my practice teaching a great adventure, where my students are the protagonists. if I have to say something classroom megative is that the only way to access the application is with an email and that is not an application that my students can download and take everywhere they go, it is only communication for when they are on the computer from their house. Muco has helped me is practical and functional to you too. It has helped me a lot in my work, I think it is an excellent application designed to improve teaching practice and without a doubt it has achieved, I believe that no teacher can be left out of the technology that is what they are asking for our students and the new society where we live. I love that Google Classroom has allowed our school to significantly cut down on paper usage. Since students can write their papers in Google Docs and submit them via Google Classroom, we no longer need to give students access to printers. If a student needs to print out a picture or an article for a project, they must ask a teacher to do it, which eliminates printing unnecessary things (i.e. 3 pages of ads when an article is only 1 page). As a math teacher, I love that it provides a place for me to post online resources for students. The newest updates allow posts to be categorized, so I have also included a category of approved math games that students can play when they finish their work. Many online educational resources also sync with Google Classroom so that you can import your students all at once instead of adding their emails individually or waiting until you can give them a class code. One other feature that is helpful is the ability to schedule a post so that it automatically shows up at a specified date and time. Currently, once you have posted an assignment you cannot "revert to saved draft." If you decide you want to hide it and schedule it for a later date, you need to delete it and recreate it. This is a great tool! It is not a comprehensive learning management system (LMS), but there is a pilot program that is working to allow schools to incorporate Google Classroom into an LMS. Google Classroom has allowed us to have online lessons when we have a snow day. Previously, if we used up all of the snow days built into our calendar, we would have to change the end of the school year or take away vacation days. Now, when we have an unexpected extra snow day we can assign work for the students to complete so that we meet the state requirements for total hours of school without changing our school calendar. "Google Classroom has made huge strides, but still has work to do"
I love the ease of integration with other Google products. As a teacher, the last thing you want to concern your students with is the mechanics of finding and submitting their work. You want their user experience to be easy, so they can focus on the actual curricular work. Google Classroom has accomplished that. There isn't much customization built-in, the material design is nice, but sometimes feels too large and boxy, and they still have room to build-in common sense features like collapsable modules in the Classwork section. If you would like to schedule a post across more than one classroom section, that is currently impossible, and is therefore frustrating. I use Google Classroom to administer tests, quizzes, homework, and projects in my chemistry classes. It makes it easy to assign due dates and "collect" work from students. Grading is also a breeze because of new grading system features that Google has introduced. "Great for teaching with technology "
I like that i can connect with my students in a safe maner and on the distance. I can grade and add more tasks from my cell phone and they can use it anywhere and can work from their cell phones, ipads, chromebooks. Etc. I dont dislike a lot. I wish there was an easier way to share the same task ina different classroom but i can handle it. Play with it before applying it. There are some things that can be confusing at the beginning but if you get to understand it before. Is going to be very helpful for your class. Well, sometimes i am sick and i have to miss school so i just add tasks into google classroom and the students receive an email indicating that they have soemthing to do and i can check if theyre working or not from my house. "Google Classroom is moving in the correct direction"
I like that Google Classroom works well as an integrated part of GSuite features and YouTube which makes it easy to create instructional videos, sheets to collect data, and student portfolios using slides. I dislike that our current grade book program and Google Classroom do not work together so grades have to be entered in more than one place. I also do not like that I can not handwrite notes on assignments without switching to another app. I find it frustrating to grade within Classroom. However, this could be due to my lack of training or not having the time to really explore all of the features. For old-school teachers who do better with assignments on paper, this product could be challenging. for those good with technology, this could definitely be a time saver. Having one place where all assignment material can be located by all students is convenient. Using Classroom has also reduced the need to make as many copies of materials that the students will need. "Google Classroom for High School students"
I like that the students have one place to go for all of their work for the class which makes it easier for them (and less excuses). It is engaging for 21st century students who prefer submitting assignments digitally. I dislike that we do not have the ability to customize many features including the stream, and that there is no integration with Google Sites. It does sometimes seem that they could use more educator feedback in developing their software. I would recommend that others considering Google Classroom make a list of what tasks they would like to achieve through such a classroom management software and then research to determine whether Google Classroom meets those needs. Many times the program seems to add features that were not developed by educators and they don't always seem to "get" what we need. Google Classroom it is eco-friendly creating less paper waste by going digital and is a great communication tool for teachers, students, and parents.
" 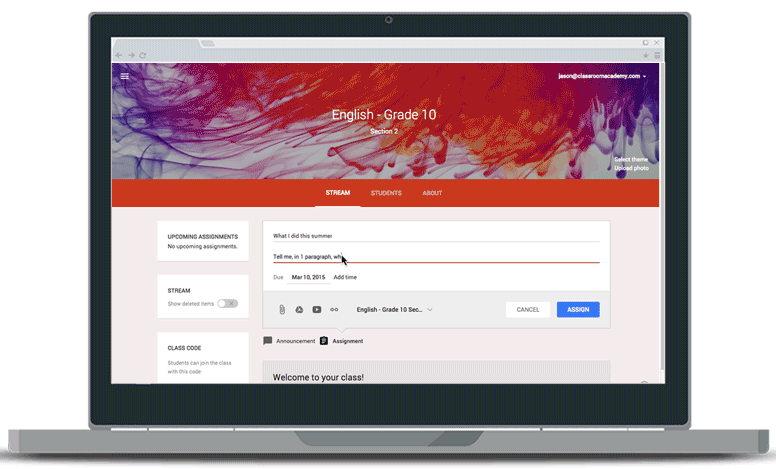 The most attractive option to give my classes"
"Best LMS for K12 and small courses"
The integration with other Google services (eg Calendar, Drive), because it allows to attach files, schedule online sessions and invite your students in seconds. Students management is pretty good. The mobile apps are convenient and don't lack functionality that is available on the desktop. There is a new Gradebook feature coming up - the beta version looks very promising. The platform can be very basic at times when more advanced functionality is needed. The feed on the first page of each classroom reminds me of social media feeds sometimes. Use Google Classroom if you need a simple Learning Management System for your online classroom and have no budget for a paid solution. It can be advantageous when basic functionality is needed and there is no budget for buying one of the most advanced Learning Management Systems in the market (eg Moodle, Totara, Blackboard, Canvas etc). "Google Classroom in Middle School"
I like Google Classroom for communication, assignment and materials management, and for ease of bringing in outside resources. If I dislike anything, it might be wish it had tools and functionality that I want. Google Classroom will take some patience, some time, definitely some professional development training for all staff asked to implement it. Then feedback from teaching staff to administration and district will be helpful. Questions could be: Does the school's administration and central office want data from Google Classroom? Can Google Classroom deliver that? What are any competitors? How should we as a site, as staff, measure (if we even need to) the success of this education management system? Or is it a neutral tool, with no judgement or measurement? As a public school, middle school educator, Google Classroom solves the problem of communication and collecting student work. I can communicate with students and their parents from within this platform. I can share assignments (projects) and their resources (materials). I can give students feedback on their projects and assignments. My students can easily create and submit their work all within Google Classroom and G-Suite programs like Docs, Sheets and Slides. I can view, type feedback, grade and move to the next student's work quite easily, almost like scrolling through emails. I can email both students and parents. And at the end of the semester and school year, it is like a binder of all the work and communication we all did. Students can comment and surveys can be shared. This is an excellent tool for students to access and view materials from the classroom such as notes and worksheets. It is all accessible online which cuts back on the amount of paper used in the classroom as well. I dislike that it is not linkable to my grading program but maybe that can be something to look forward to in the future to help streamline things even further. Go for it, it is honestly so easy and keeps track of assignments for individual students. You can even go all online if the technology is available to you. I love using it for absent students to find their missing assignments but it also good for assigning classwork/homework. It may take time to get used to using it but it is worth the learning process. It allows me to store assignments and notes for students who are absent so i am not bombarded with the same "what did i miss?" question. "since I discovered this tool of google, I have not stopped using it." I really think that Google with this application has given me everything I need, there is no detail that I do not like, it is very useful and work for me as a classroom teacher. the only drawback is that it is a tool that should be used with the internet and in some cases some students do not have this constant service and therefore could in some cases delay my expectations. After using it with my group of students and getting such good results, I recommend it, because I know that it will go well for you as well as me, it is very good to embed in this technological world, and boost education to another level. thanks to google clasrrom I have had many benefits as a teacher, today young people are 100% involved with technology and it is a good way to reach them, I as a teacher of mathematics, I must manage many ways to grow motivation in them of this specific area, since many consider it to be a very difficult area and are already predisposed to learning, using the technology that this application provides me. I have obtained a lot of motivation from my students. Every day their effort and improvements are noticed when reaching the goals. proposals. "Very flexible and useful for individual classes taught anywhere, independent of the school's system"
You can set multiple classes and organize the teaching structure as you want it. You can assign tasks at will, setting deadlines for completion. the system can automatically grade based on completing the task, or you can post your own grades. 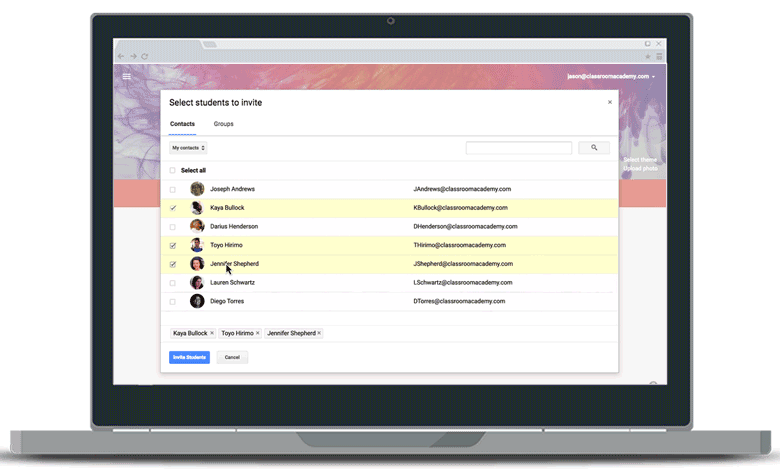 You can share files, provide instructions and communicate easily with all the students as a group, or individually.You don't need separate credentials, you can use your existing gmail account. It is free. The overall visual presentation of the structure you set and the students names etc is not very intuitive or attractive. Even for a minimalist type design it lacks some pizzas to make you enthusiastic about using it. It is very functional, but it stops at that. It doesn't have any extras that a teacher might like, e.g. some way to involve parents, attendance, discipline etc. Go for it. Keep in mind that all students that you have in class must have a gmail account and be able to use it/access it at home too. Easy way of assigning tasks in almost any kind of class settings. I am using it for Computer Sciences & Physics classes, but my colleagues are using it for Reading, Literature, Writing etc. Very useful to keep everyone up to task and see how timely the assignments are solved. I love that it makes it easy for me to reuse an assignment that I've created. One of the biggest pieces for me is "by book" sections so the assignments need to be repeated for 14 different books with small tweaks and this is super easy in Google Classroom. There are some basic functions that have been "in processing" for what seems like forever, like a badge system. These would make it much more dynamic and the kids would get more out of it with a little more capability. There are ways around the things it does not do. The fact that is is based in Google makes it easier to manage if your system is on google instead of Microsoft but there is so much integration available. I love that I can have kids link to Drive or Docs, they can submit forms, or work on presentations and it is all readily available. You just have to play a little bit in order to do some of the weirder stuff, like the aforementioned badges. It makes collaboration as a teacher really easy. I love that my teacher of record and I (a student teacher) can work on things when we are apart and when I am not yet in the classroom full time. I can also see what my kids are up to on days I am not there. "Google Classroom. Tu aula virtual"
Es una plataforma ideal por su intuitiva que te permitirá gestionarla al docente sin dificultades y encantará a los estudiantes por vanguardista interfaz. Además es realmente útil, ya que te permite organizar tus cursos desde esta plataforma en línea que no requiere ningún tipo de inversión por parte del centro de estudios, pues Google la ofrece gratuitamente. Con Google ClassRoom podrás mejorar en comunicación con ellos y en ofrecer recursos como apuntes, presentaciones y ejercicios desde un repositorio de datos centralizado, con espacio ilimitado en una cuenta de Google Drive. Ganas en control, porque podrás crear tareas y comprobar que alumnos la han entregado a tiempo. Lo único que necesitas es un navegador y conexión en línea. Al ser una plataforma en línea es obvio que si hay fallas en la conexión, ese día tendremos problemas con ClassRoom. No te permite crear grupos de usuarios para otorgar derechos y permisos sobre los documentos a editar y hay que ir uno por uno. También se echa en falta la posibilidad de agregar padres o tutores, ya que si se trabaja con menores de edad, ellos deberían estar presentes en este tipo de plataforma. Genial plataforma de organización de aulas y centralizar recursos educativos digitales. Al grupo de docentes que la utiliza nos ayudó a centralizar los recursos necesarios en clase y facilitó la metodología de trabajo en el aula. Los alumnos también están contentos porque les es más fácil estudiar y preparar los exámenes y comunican mejor con sus profesores. Además, según me comentaron los del equipo de implantación, va incluido en el paquete de Google Apps for School, que se oferta gratuitamente en escuelas, academias, institutos y universidades. Con lo cual, no afecta al capital del centro. "Very useful tool to create and manage eLearning courses"
I have a while using Google Classroom and I really like it, I like a lot this online platform to manage my online courses because it is very easy to use and accesible to my students, I use it communicate with them, leave homework and extra material for them to study. This platform is very accesible for all of my devices, I access by Google Chrome so there is no waste of time. I love that I can share my files directly form Drive, so my students can access directly from their Drive account in order to see and keep the files I shared them. Also, I can edit and personalize the desktop as I wish. There are some things that I do not like that much about Google Classroom. For instance, If you want to work with this platform it is mandatory to use Google services to manage your resoures easier, Unfortunatelly, this virtual classrom does not connect with Google Calendar so I cannot schedule assigments in my calendar. FInally, I have to give permision to each student separately if they need to edit a document, it could be a problem if you have a lot of students. You should give Google Classrom a try if you want to start giving classes online. In my opinion, this is the platform to start in the eLearning world because it has all the basic features you need to manage your coueses. With the time you will realize if this platform keeps working for you or if you need to change to other tool. I use this tool to communicate and share material with my students. I provide them with assignments, extra material, links, videos all kind of information they need in order to cover the content of each module I teach them. "Communication inside and outside the classroom." I like Google classroom because it allows me to contact my students outside of class hours to reinforce their knowledge as well as send and receive assignments through this application, I also love the bulletin board that owns the software because I always publish the activities, the notes and reminders of the evaluations which has allowed my students to improve a lot. I consider that this software needs to include the representatives, because they also play an important role in the educational process. 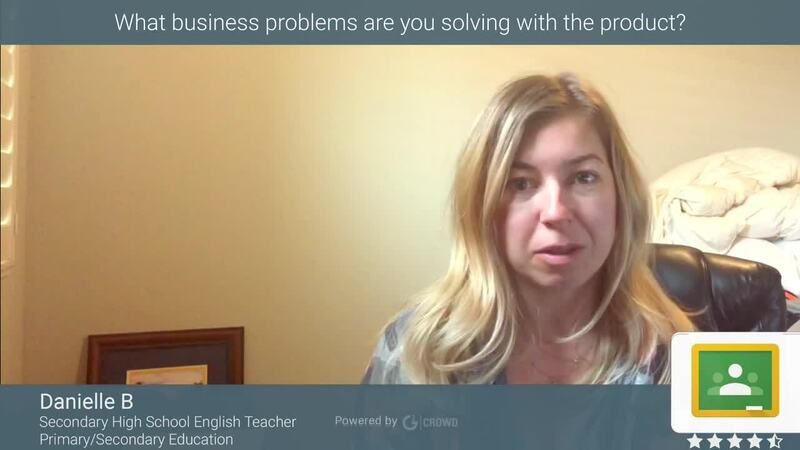 As a teacher I recommend this application for constant communication between teachers and students inside and outside the classroom, because it is very useful in the educational field, it is very easy to use and totally free. This application has greatly benefited me, since since I use it my students have improved markedly, since now they prepare their tasks on time and prepare for the class of the classroom with the exercises and the tasks that are public through this software, in addition It has allowed me to review the tasks of my students in real time, which allows me to save time. Google Classroom for teachers is easy to set up and easily used by students. Teachers can have all the information and assignments in the classroom in one place. Students can access their studies or assignments from anywhere, if they have the Internet. It would be useful to have more sections so that students do not have to scroll through so many assignments. Although there are different tabs, it would be nice to have some additional categories. Customizable notification seems to be handy. I need to receive notifications for certain classes, I do not want to receive them for everyone. At the moment, there is only the ability to receive everything or turn everything off. This is a great tool for the digital classroom or for the tasks that you want the students to type. The Google class is a great way to ensure that all students have access to the assigned materials, digital copies of homework assignments, and access to resources used in the classroom. This can save a lot of time and headaches for lost worksheets and students who say they do not know about the timing or upcoming tests! "Perfect for both me and my students"
Google Classroom is easy to use. It allows you to conduct dialogues with students. If you are already familiar with Google products, you will easily understand this interface. Deep integration with Google services. It is easy for you to send students links, documents or videos. There is no way to automatically create a video conference or chat with my students. There is no way to connect third-party services to extend the functionality. There is also a problem with checking homework, the program does not have complex mathematical symbols, and photos are difficult to read. This system has all the possibilities for a good organization of online learning. If you do not have time to understand the complex LMS for a long time, you definitely should try Google Classroom. I create and publish course assignments and examinations. Also, we forward homework. I like this service for both me and my students. Organizationally it is easy to see the student's work and has it all in the same spot. You can share websites on the fly with students by pushing them out to them instantly. The assignment function is really helpful as well. The constant updates are somewhat frustrating as it seems to happen overnight without notification, but they are intuitive so it is easy to pick up on the new layouts or functions. Take the google training as there are lots of functions that can get lost if you haven't use them before. Having 1 place where all announcements and assignments are housed is great so that people know where to find the necessary information. It is nice to have all of the grades in one spot and it eliminates the need for paper copies of everything and can allow for collaboration for the kids on shared assignments. "Great for Classrooms of All Ages"
I use google classroom with my fourth graders and it is a really efficient way to share links and information with my students. I use it most often to send all students the same link and information rather than sending it via e-mail or verbally sharing it. The use of assignments aren't as clear to younger students as older ones. They don't fully understand how to access, complete and mark finished assignments in google classroom. Consider the age of your students and what tasks you would have them complete when using this product. For elementary aged students it is best used to disseminate information and share links. This has solved the inefficient use of e-mail for sharing links with my students. The benefit is that it is time saving. It also prevents students from having to copy a link into their browser from the board which is often not accurately done.
" Tool that allows the organization of educational process in an efficient way"
What I like about Google Classroom, is that it is a tool that allows a better interaction between the teacher and its students, sharing an endless amount of resources provided by the Google platform; To facilitate and optimize learning, in this tool the teacher organizes the activities of a section, on a specific subject, allowing to structure the time as a function of the activities and generating a calendar where the classes are described, the tasks also allows to present and download a set of documents attached or downloaded from the google drive or using the you Tube platform that in a simple way allows to reinforce the content of the classes taught. The problem of the tool is based on the elements of interaction between the students and the teacher, since the interaction is public or at least of the guests that the administrator decides that they are in the class and in this sense some students have limitations with the use of google. there are also difficulties with the videos of you Tube slow to load and the students complain that they can not see them, the other element that stands out is the linearity with which the tasks are created, elements of social networks must be included to make it more attractive for students with particular interests google books should be by default according to the theme created for the class. The tool solves a communication problem on the one hand and allows to complement the activities after school with access to documents and videos that reinforce the activity, also allows you to have clarity of the important dates of the course especially with the evaluations and allows to create collective of learning among the active members of the class. "Easy-to-use LMS for teachers and students!" I am a high school computer science teacher. I've used Moodle and Canvas as my learning management systems before, but they were complicated and did not have a speedy grading system. Plus, I had to do lots of hand-holding while showing my students how to navigate the site. Google Classroom is the opposite: it's easy for my students to learn, easy for me to learn, and has great snapshot views of work they have submitted. I can see all of their work instantly on a single webpage! There are some features that Google Classroom does not include. You cannot choose a custom color for the menus and accents, it chooses a color automatically based on the cover photo you choose/upload. This isn't a big problem for me, but it would be nice to use my school's official colors instead of one that is just similar. Also, there is no option to edit the HTML on the page like you can in some other LMS options. This can be limiting, but is overall not a very big factor for me. If you want a simple, easy-to-use learning management system for both yourself and your students, try Google Classroom! It's completely free for everything, no extra add-ons that you or your students have to pay for, ever. You can keep the accounts infinitely as far as I know, so your students' work is always there. Each student has a Google drive folder created for them, and I haven't had a student delete their work yet, so it's still there if I need to look at it! All they need is a Google account, which is also easy to create if they don't have one. I have a Google Classroom for each of my class periods, which means I have seven right now. I am also a member of one other Google Classroom made up of AP Computer Science teachers, where we share ideas for teaching our lessons and help each other. It simplifies everything to have Google Classroom as the LMS for all of my classes, because I don't have to upload files to multiple sites for different classes. I'm spending a lot less time grading as well, since I can see all of the work my students submit in preview mode on a single webpage, with the gradebook built in on the side. I love that feature! It's easy for both students and faculty members to use as our district transitions to being a 1:1, personalized learning school. Google Classroom operates as if it were designed by an educator. I would like to see more interface and background design options when creating quizzes and other documents. The design of the feeds can get repetitive. As a teacher, it's a great way to stay connected and organized with each of your classes. It's easy to edit documents and class sections. Students are accustomed to using it already, as we are moving to less/paperless classwork. It is a vital tool for our district as we move to a curricula of personalized learning. It allows us to streamline documents and media for each of our classes. "Very good for university classes. " I like that it allows students to be included in virtual classes in a very simple way, that allows me to schedule activities and evaluations can be done through the platform. I have nothing to add, Google Classroom is an excellent application. I recommend using this application at any educational level, since I consider it an excellent educational software that allows the teacher to be contacted with students outside the classroom. I believe that the benefit of Google Classroom is that all people who have access to a computer and the Internet can access Google Classroom, so it is an inclusive software where all my students can access in a free way, which favors great extent the educational process in any university center. "Google classroom is a great tool for any school district"
I like that you can put a link up or anything you would like the students to do and they can do it either at school or at home. It is very user friendly and the kids can resort back to it at anytime. I would like to have a training on this to see all that is available through Google classroom! Being in an education setting we are presenting students with various educational programs such as Stop Motion Animator, Quizzes, and flip guard to help them to build their technology skills also can go on virtual field trips together such as the San Diego Zoo, just to name a few. "Great tool for the classroom (but not yet ideal for group work)"
The best feature is the integration with the Google Suite, allowing the option to attach a single Google Doc and select the option to make a copy for each student. Every student then has a copy to work on directly and turn in as their own. At the time of this review, Google Classroom isn't currently built for group work (that is, there is no way to assign group projects where students can all work collaboratively on an assignment and turn in a single product). My students continually complain about this given the structure of our lab and the assignments. You can work around this, but it's cumbersome and a bit aggravating for the students working together. I've used Google Classroom as both a student and a teacher. It's a great platform to organize announcements, assignments, and other class info (and superior to Blackboard in my opinion). It integrates with the rest of the Google Suite, allowing you to directly attach Google Docs and Sheets as assignments and materials. "Useful for keeping students up to date on assignments"
I like that you can set specific times for tasks to be done or assignments to be turned in. It can help pressure students into using class time to finish their tasks or have them show up as turned in late--this works well for students who tend to waste time in class but would need to be adjusted for students who need extra time on tasks/have IEPs with that stipulation. This works well for teachers who deal with a lot of student absences--it is easy to point students to Google Classroom than trying to send separate emails/photocopies for everything they missed. As mentioned above, it helps students have a time deadline for classwork so they don't waste time and it helps students who have been absent to easily scroll through the classroom posted documents and tasks to see what they've missed. "Excellent product - very helpful for students"
It gets the job done. I can add PowerPoints, videos, classworks, presentations, and incorporate quizzes and other materials to provide a virtual classroom for students. Google classroom has to be used while on a computer and requires internet access most of the time. While power and internet outages don't happen as much, they can and we have to rely on alternate methods. It also has to be used on a computer which can be a distraction for students - even if certain sites are already blocked. There is no "one way" a student learns. Many students do not have the opportunity to go back and process information at their own pace. Google Classroom provides the opportunity for students to sit back and not worry about taking notes (which some may argue is problematic, because physically copying notes down may positively correlate with memory retention), but instead, process information and ask meaningful questions that not only show understanding, but expands upon the information presented. It also wastes less paper, and purchasing Chromebooks and doing the repairs is much less costly than printer/copier maintenance and paper/ink purchases. 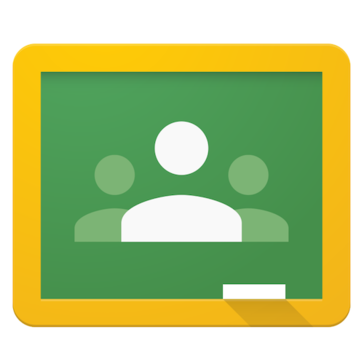 "Great concept, but not user-friendly"
Google Classroom is an amazing concept - a place to connect teachers and students using the incredible G-Suite. I like being able to share copies of Docs/Slides to my students efficiently. I do not like the way you have to scroll endlessly to find things. Yes, there are "Topics", but that is the only way to break-down/organize the different assignments, announcements, and quizzes I post. I would love to see a tile system or something that looks like Canvas. Simplifying technology negates one of the biggest benefits of having 1:1 initiatives in schools - learning how to maneuver through the digital world. My biggest complaint would have to be GRADING the Docs/Slides that my students submit on Google Classroom. It sometimes feels like it takes an eternity to load each file. I'd love a preview-style window on the Grades screen. Google Classroom is worth using, but if, like me, you are required to use it versus another program, you will find flaws and shortcomings quickly. I use two Classrooms, one is dedicated to quizzes/responses just to keep my main Classroom less cluttered. I also use the Announcement feature to post and update any classroom information (passwords, codes and links to certain websites, etc.) so that my students can find it easily.